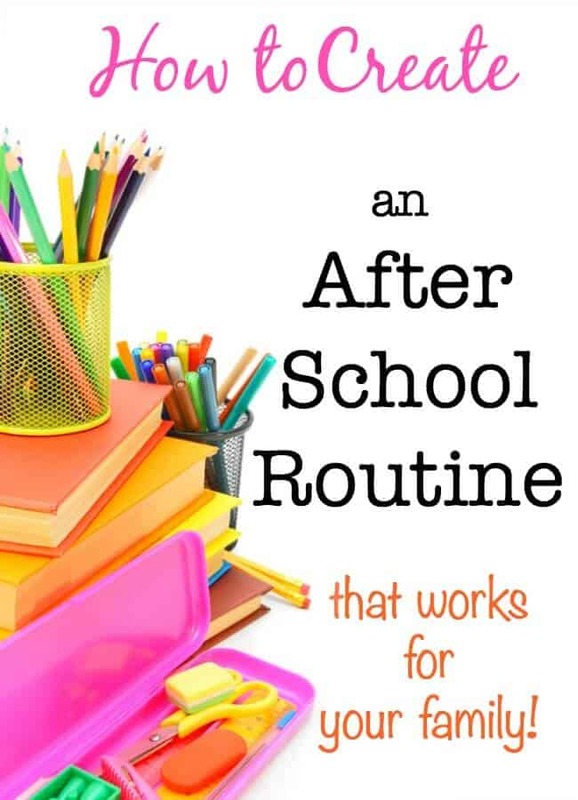 Here's how to put into place a flexible after school routine that allows your kids some time to wind down after a big day at school before moving into all of the after school work and activities that follow. 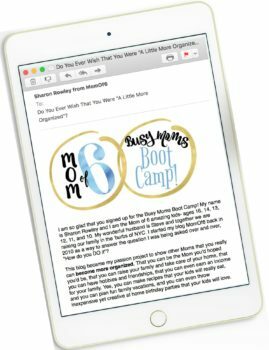 I'll walk you through the process we used when my kid were in elementary school, and I think if you give it a try at your house- you'll find that using family routines is a great way to get organized! After the kids have charged off of the bus and blurted out the 15 things each that they couldn't wait to share with me, we all hop into the car for the quick drive back up our long driveway. This can feel like a crazy time of day- everyone is loud, everyone is (usually) happy, some are hungry, and some are pretty tired and worn out. I try to herd everyone into the house, and allow them a few moments to drop their backpacks on the floor, grab a snack, and just chill out for a few minutes. My friend Lisa calls this time “snack and chat”- it's a time for the kids to re-fuel and talk a little bit about their day. Once they've had a moment to relax a little, I will remind them to get their backpacks and start the unloading process. In the past I used to try to get them to do this as soon as we walked in the door, before they had their snack, but I learned that they weren't ready to be helpful yet- they had worked hard to follow rules all day long and they need those few moments of winding down before they can really listen. My kids pull out their lunch bags and snack bags out of their backpacks, and put them on the kitchen counter near the sink, and then rinse them out their lunch containers and load them into the dishwasher. As they are unloading, I first focus on going through each child's paperwork, which they have placed in my school papers inbox. We will look through all of the paperwork together that comes home and we take care of the “filing” as we go through it. If it is a permission slip that needs to be returned to school- it gets signed immediately and placed back into the child's folder to go back to school. If it is a reminder notice or a flyer for an upcoming event- I immediately note it in either my monthly calendar of my weekly planner. If I need to keep the notice for the details it contains (directions, etc), then it goes on a clip on my blackboard in the kitchen- filed according to date- so the item on top is the item that is occurring first. If I do not need to retain the notice, then it goes into my “paper basket” too. If it is a truly special piece of artwork or a really great writing piece that my child did, then I hang it up on the refrigerator for everyone to admire! And if it is a homework assignment that we need to complete, it is placed on top of their school folder, and stays on the kitchen counter. Or if we are headed out to an after-school activity for one of the other children, it might get placed on a clipboard so he or she can work on it while the sibling is doing their activity. But the folder stays on the counter, as a reminder to me and my child that we cannot pack it up in the backpack yet. If no homework needs to go back to school, the school folder is placed back into the backpack for the next day. For us, this process can take around 15-20 minutes in total to go through each child's folder with them. For my older children who also use planners at school to record their homework assignments, we will review the planner at this time, and talk about how he or she will complete everything that needs to get done that afternoon. At this point (unless we are heading right back out the door), some of my children prefer to sit down at the kitchen table and just get all of their homework done. I make sure that I stay in the kitchen too so that I am available to help them along, and review their work. But some of my children would rather play for awhile first, and I think that is perfectly fine too- as long as that child and I have agreed upon a time when they will come back to and work on their homework. I want the kids to be as self-sufficient as possible when it comes to getting ready for whatever after school activity we have planned next. 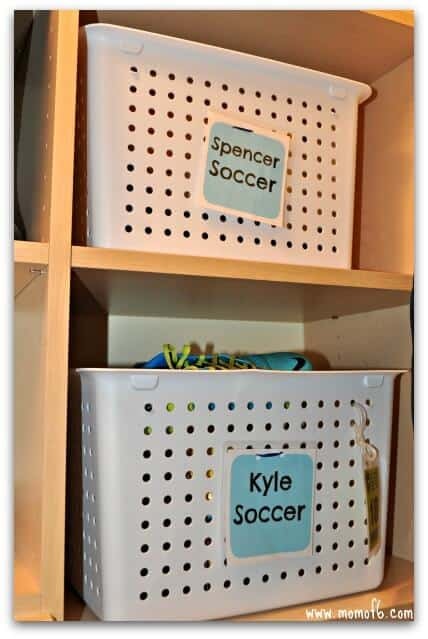 So I have set up “kits” (plastic bins) for each activity for each child. These bins are stacked up in the kids' coat closet, and it is easy for them to pull them out and start getting themselves dressed and ready to go. And actually, many days I will pull out these kits and add water bottles to them so they are waiting for the kids once they arrive. The key to making this kit system work is to make sure that the plastic bins get re-loaded with the gear once the kids return, and the clean uniforms are returned to the kits after they have been washed. I would love to hear some of your ideas on how you handle the after-school routine! « Family Routines: The Perfect Morning Routine for Your Family! Sounds like my house! Ae you sure we are not related? 🙂 the only difference . . My kids all come home at different times. Last year we had 5 kids in 5 schools, but this year it’s only 4 schools, AND my oldest is driving now, so that frees up an hour in my afternoons to help the younger kids, get dinner ready, etc! I like your black board. 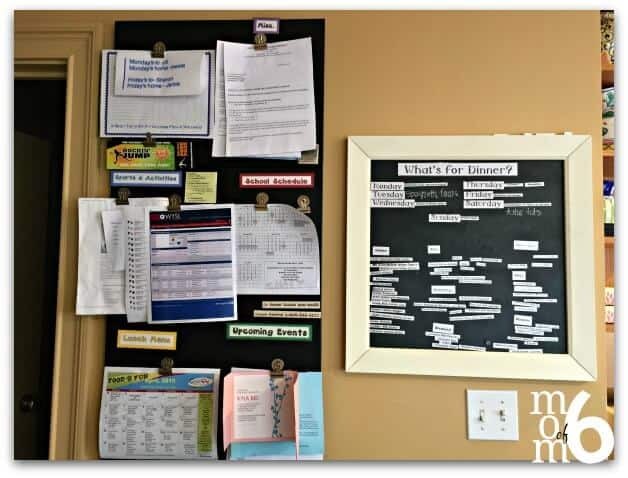 I have a similar area on the wall with a calendar, papers and whiteboard . . By its not as nicely organized as yours! I might have to make it look nicer after seeing yours! We must be related organization-ally! 5 kids in 5 schools? That might make me insane…. you really do need to be super-organized to keep all of those schedules straight! After school routine in our house includes computer time. My daughter gets off the bus, we jump into the car and drive back to her school to grab her brothers (Tae doesn’t want to stop riding her bus, and since the bus drives by my house anyway I allow it, however we live too close to the school for the boys to take a bus so they are walkers). We grab the boys, and drive back home. The four of us attempt to get in the house without the dogs escaping *L*. From 2:40-3 everyone grabs snacks. 3-4 Tae uses the computer and I help Tony with his homework. From 4-5 Tony uses the computer and I help Taelin with her homework. At some point between 3-5 I also help Davan. From 5-6 or 6-7 Davan uses the computer. While I am helping the kids do their homework I am also checking their folders. While making dinner unneeded papers go into the recycling bin, pictures/work goes in a pile until I can discreetly place it into the recycling bin (I made the mistake of getting busted once, hooboy). I love hearing how other people deal with the after-school routine. Sometimes it feels mind boggling how many hours a night (and a week) I spend sitting next to the kids and helping out with homework! I love your blog!! I have 4 children 10 yrs & under in the house & a 20 yr old out. I’m trying to get more organized, so Im not running aroung like a frantic, stressed out person…which is usually how it is now 🙂 I love the idea of the mesh bins- seems like we are always trying to find unforms, etc. could you post a picture, or tell me where you got them? thanks!!! Oh wow- I so wish that I could find that deal on bins again! I stumbled across it at some website about 5 years ago- and I was able to buy a box of 36 bins for less than $70. Now they aren’t the best quality- but at that price, I couldn’t pass it up! I have found nicer ones (for more money) at Target and at the Container Store, and they have remained in great shape holding toys, balls, and other assorted kids treasures over the years! I couldn’t live without my bins! thanks! i will check there!!! I appreciate your info. My house seems so crazy when I come home w/ the five kids from school. Four of the five are in elementary/middle school and then I have a three yr old. Half want a snack/; one is doing homework and demanding help before I am even in the house w/ the three yr old. And the other two are fighting; already! It is my least favorite part of the day; especially on a day when all five have been at school- I want to send them right back. Some days some of my crew empty their lunch boxes; and then the others well it doesn’t happen. I guess my problem is lack of consistency. I start out every school yr w/ a plan for after school routine and it always goes to hell in a handbasket. One thing we always do that really helps save time is the minute we walk in the door from school (or anywhere), all shoes are removed and placed on a small square of carpet right behind the front door. That way, we are not tracking dirt/leaves into the house (that will then need to be cleaned up), and we are not frantically searching for lost shoes in the morning while getting ready for school. Do you miss the days when the after school routine included carrying three sleeping children from the car to the couch?? Ahhh……. yes indeed….. the good old days…… now it is just me that would like to be on the couch, sleeping!